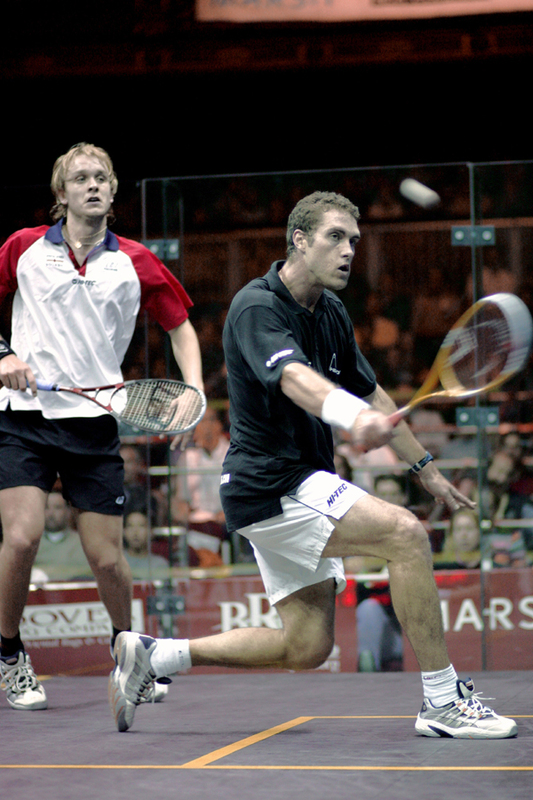 David Palmer has taken a strong stance, allowing himself to remain balanced as he powers the racket across his body. Note the good distance between the feet, and between the body and the ball, giving him a strong striking position rather than an improvised one. Palmer is square onto the side wall, making it easy to play a straight volley if he chooses, but he has taken the ball out in front and fired it crosscourt. Note though how he is still focused on the impact point and how he has braced himself as he swings thought the impact zone – there was no chance of missing this shot. Palmer’s opponent, James Willstrop, has recovered the T well and is up on his toes but is perhaps drawn into expecting the straight shot. Palmer looks as if he has a hint of deception on this crosscourt volley. If he plays it at the right angle, Willstrop is not well placed to intercept it – it may even force a boast but it will certainly push his opponent back and allow Palmer to dominate the T on the volley, which is what he is doing. Perhaps Palmer is thinking ahead and will look to intercept a lifted straight drive return from Willstrop with his famous crosscourt volley nick. - Set up strong striking positions for all your shots, even your volleys. - Set up your shots so that you have alternatives and can vary straight and crosscourt shots. - Try to brace yourself on balance for your shots and focus on the impact point. - Use the volley to dominate the T, keep your opponent back and apply pressure. - Don’t be drawn into trying to attack every volley opportunity. Get a balance between long and short volleys. - If you give your opponent a volleying opportunity, push right up on the T as soon as you can (you will have less time) so that you can cover your opponent’s alternatives. Intercept if you can. Try to get in front and get on the T yourself.